Ubisoft has announced the development of Assassin's Creed Revelations, the fourth installment in the popular video game franchise. The game will be released on the Xbox 360, the PlayStation 3, and for Windows this November. In addition to the campaign, the online multiplayer experience will return with more modes, more maps, and more characters that allow players to test their assassin skills against others from around the world. The gameplay will also allow players to manipulate the construct of Desmond's memories and the Animus to decipher the mysteries of his past and gain insight into the future. The game is once again being developed and led by Ubisoft Montreal. It will also get support and expertise from Ubisoft studios Annecy and Massive Entertainment located around the world (Quebec, Singapore, and Bucharest are specifically mentioned). In Assassin's Creed Revelations, master assassin Ezio Auditore walks in the footsteps of his legendary mentor, Altaïr, on a journey of discovery and revelation. It is a perilous path – one that will take Ezio to Constantinople, the heart of the Ottoman Empire, where a growing army of Templars threatens to destabilize the region. "Delivering the final chapter of the Ezio trilogy is an important milestone in the Assassin's Creed franchise for us and for our fans," Alexandre Amancio, Creative Director at Ubisoft Montreal, said in a statement. 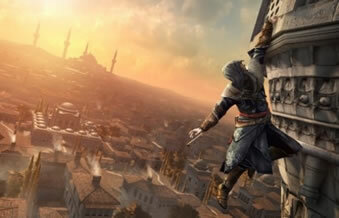 "Assassin’s Creed Revelations includes lots of new features and some significant surprises. We can’t wait to show our fans what we have in store at E3 this year." Assassin's Creed is a science fiction video game series that so far has consisted of three main games (Assassin's Creed, Assassin's Creed II, and Assassin's Creed: Brotherhood), a Facebook game, a short film (split into three episodes), as well as two novels and comic books. The games appeared on the 360, the PS3, Windows, PSP, NDS, 3DS, iOS, webOS, Android, Facebook, Mac OS, and Symbian platforms. Although there have been various other games, the first three main games, which were only available on the Xbox 360, PS3, and on Windows, have sold more than 28 million units worldwide. The fourth game should sell well also, but we'll reserve further judgment until we see more details (such as a gameplay trailer).